Closely watched case could have reshaped college athletics. Federal regulators Monday turned away a push by Northwestern University football players to unionize in a closely watched case that could have reshaped American collegiate sports by essentially classifying athletes more as employees than students. The National Labor Relations Board declined to decide whether the scholarship players are employees who therefore could join a union. The board suggested a ruling involving one private university that plays against scores of state-run schools, over which the NLRB doesn’t have jurisdiction, could affect competitive balance. The decision by the board of three Democrats and two Republicans, all appointed by President Barack Obama, was unanimous. If the board had ruled the players are university employees, it could have allowed them to bargain over issues such as medical coverage and practice conditions. The precedent could have emboldened unions nationwide and spurred athletes at other schools to seek the same approval from the federal agency. Though state-supported colleges and universities are beyond the NLRB’s jurisdiction, state labor boards often follow NLRB precedent. Collective bargaining also could have caused conflict with the National Collegiate Athletic Association, which has rules that run counter to what some players at universities might want, such as salaries. The NCAA backed the board’s decision, saying the NLRB recognized that the organization “continually evolves to better support college athletes.” Close watchers of the board, which resolves workplace disputes and oversees union elections in the private sector, had expected its Democratic majority to declare the players employees. Northwestern had appealed to the five-member board to overturn an NLRB regional director’s decision that the players are employees and can join or form a union. The board said allowing unionization “would not promote stability in labor relations,” reflecting its view that the matters under debate belonged under the NCAA’s jurisdiction as part of the group’s wider purview in overseeing collegiate athletics. The regional NLRB ruling last year found players on the 112-member team clocked more hours than “many undisputed full-time employees” work, and more than the players spend on their studies. The ruling found the 85 scholarship players in place at the time at the school had athletic duties that required as many as 60 hours a week during training camp and 50 hours weekly during the season. Northwestern, in its appeal, argued the decision ignored evidence showing the players were primarily students and not athletes. The school, which is in Evanston, Ill., also said the decision failed to apply a legal precedent from an earlier NLRB decision that found another university’s graduate assistants were mostly students. 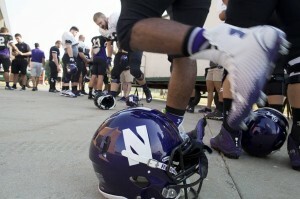 Northwestern spokesman Alan Cubbage said Monday the university is “pleased” by the board’s decision and strongly believes “unionization and collective bargaining are not the appropriate methods to address the concerns raised by student-athletes.” The ruling issued Monday won’t preclude scholarship players at other private universities from asking the NLRB to declare them as employees for union-organizing purposes.